Looking for an affordable and feature-rich web hosting package that will help you grow your web presence alongside your business or brand? You might want to consider Network Solutions. Like any other web hosting provider, Network Solutions claims to offer the best tools to help you create and manage a website. They hosting service is jam-packed with features, including user-friendly website-building tools, a wide range of eCommerce tools and services, email marketing capabilities, and a whole lot more besides. 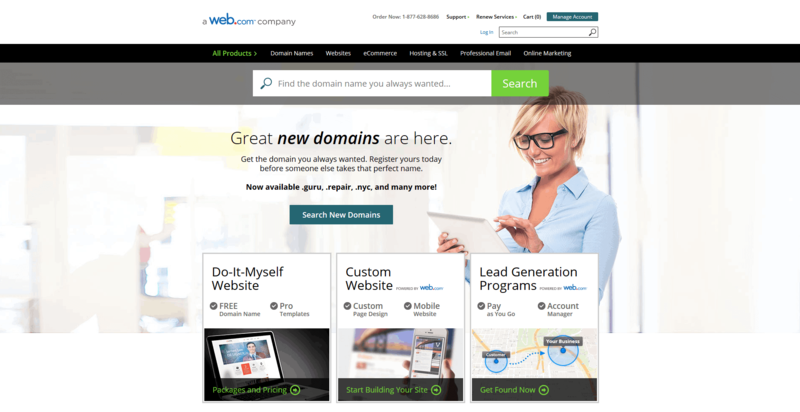 Network Solutions is mostly known for their domain registration and online marketing services but in this review, I will be focusing mainly on their web hosting services. In this particular area, chances are you’ve probably heard of their name at one point. They’re not as popular as they were before, but it goes without saying that they belong to the upper half of the fold. They promise to give you everything you need to get started, no matter what type of site you’re planning to build. Network Solutions is a full-featured web hosting provider that offers shared hosting and VPS hosting packages. They also offer a custom plan for managing a WordPress blog, as well as an eCommerce package for building an online store. Not only can you purchase a hosting plan, you can also get your domain name from Network Solutions, as well as many other options like website builders, SSL certificates, email accounts, and pretty much everything you need to start a professional website. Now let’s take a closer look at their plans and the features that come with them. Network Solutions’ shared hosting plans are offered in three different options: Web Hosting, Professional, and Premium. The price starts at just $9.96 per month to $21.62 per month, with a 1-year term. Their basic shared hosting plan, Web Hosting ($9.96/month) is ideal for individuals and small businesses that are looking to build a simple website and just want a basic web presence. The package includes 300 GB of disk space, unlimited bandwidth, a FREE domain name, and 1,000 email mailboxes. 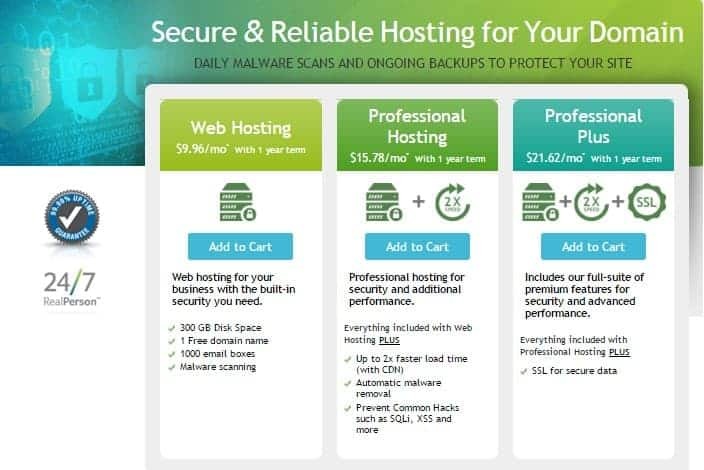 The Professional hosting plan ($13.29/month) is ideal for businesses that are expecting high traffic volumes in their websites; offering 500 GB worth of storage, unlimited bandwidth, and 2,500 emailboxes. It also allows for automatic malware scanning. Meanwhile, their high-tier package, Premium ($21.62/month), includes a full suite of premium features and unlimited resources, plus SSL for secure data and advanced performance. It’s best suited for companies that are expecting growth in their site, alongside their business. The good news is that Network Solutions offer the two main types of operating system (OS) platforms where you may host your website: Linux and Windows. 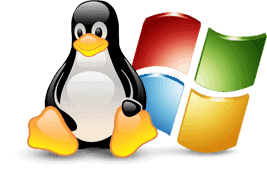 Both the Linux and Windows platforms come with their own set of unique features, pros, and cons. Most people would go for the Linux platform as it allows you to add dynamic content on your site using PHP or CGI scripts, and lets you interface with a MySQL database. But if you’re going to use ASP/Access scripting combinations, MS SQL database, VB scripts, and/or ColdFusion, then a Windows-based server is the way to go. Between the two, Linux hosting is generally seen as being more stable. It performs faster and is more secure. Most malware we know are written to cause damage to Windows. But if you really need to develop a site or application in ASP.NET or Virtual Basic, then there’s no choice but to go for Windows hosting. Personally, I recommend my readers to use Linux, unless you need specific features and/or apps that only work on the Windows platform. Also, take note that the OS you use on your desktop is completely independent of the OS you choose to host your website on. Besides these, Network Solutions also provides add-ons at an extra cost. If you don’t need a lot of fancy features and options, however, this web host is a wallet-friendly choice. Their shared hosting plans even come with a free website builder that includes a collection of professional-looking templates, a library of stock images, FTP access for uploading files, an extensive repository of open source tools, and more. 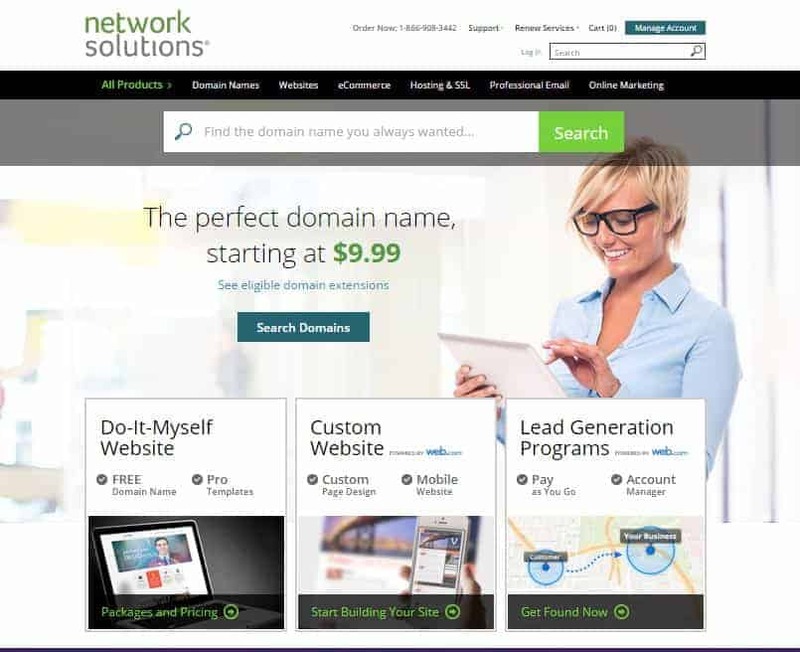 As you can see, Network Solutions give you plenty of options to build a basic website at a reasonable price. They even offer unlimited disk space and monthly data transfers even in their low-tier hosting plan. But if you do a side-to-side comparison with other top brands like BlueHost and iPage, you’ll notice that their shared hosting plans are more expensive by a few bucks. That said, Network Solutions come with a few standout features of its own. Before you decide to sign up with them, make sure to compare them with other web hosts first to see which one gives more value for money. For tech-savvy webmasters and businesses that require more hosting muscle, consider Network Solutions’ VPS hosting, which starts at $40 per month (cheaper if you go for a multi-year term). With VPS hosting, you’ll get full root-level control hosting. It gives you independence from other site owners on the same servers, and lets you enjoy the control of dedicated web hosting without costing an arm and a leg. Network Solutions offers two VPS sub-plans: VPS Essential Hosting and VPS Professional Hosting. Essential Hosting is ideal for starter websites, and includes 10 GB disk space and 500 GB bandwidth. It’s also packed with server management and virtualization tools, and a choice between the Parallels Plesk and Virtuozzo (available on both Linux and Windows platforms) control panels. Professional Hosting builds upon Essential Hosting, but with a skimpy 50 disk space and 2000 GB. The web host also limited you to just 1 GB of RAM and just 200 email accounts. There are far more impressive offers, like in eHost. Up to 200 nsMail emailboxes to set up and assign to team members, users, clients, etc. If you’re looking for better alternatives, consider checking out other web hosts that offer a choice of Linux and Windows VPS hosting plans, like Arvixe. You can upgrade your plan with up to 4 GB of RAM and 100 GB of disk space. They also offer unlimited emailboxes and bandwidth. Although all of Network Solutions’ hosting plans come with a few eCommerce add-ons like the ability to put PayPal buttons on your site, their entry-level hosting plan, don’t include true eCommerce options. If you’re looking to build a fully functional eCommerce site, you might want to consider signing up for their eCommerce Website plan, which is available for as low as $7.95 per month. At the time of writing, Network Solutions is offering limited-time discount promos on their eCommerce packages, so hurry before it ends! 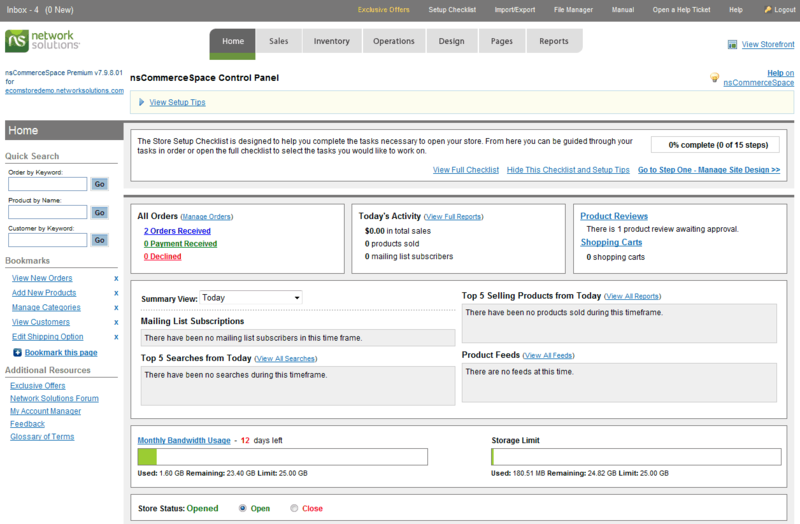 Built-in marketing tools for social media, comparison shopping, SEO, etc. Want to see how their eCommerce package works? Network Solutions even provide a demo so you can test it out before you even make the purchase. With an eCommerce package, you’ll have the ability to create a catalog of products for your customers to purchase, along with the freedom to set shipping options and accept credit cards. Unfortunately, Network Solutions require you to use a different website building tool that’s completely separate from the desktop and mobile builders. Based on real customer experiences, I found that these two site builders aren’t nearly as intuitive as the ones offered by other top web hosts. The actual process of setting up WordPress is easy. Simply click the “Add” button for the application, define the URL, admin username and password via the setup wizard, and you’re all set! The only problem is that the option to create the blog is buried deep in the interface. This has been a common complaint among users, but this is probably because Network Solutions have thrown in a lot of capabilities and features in one place that it’s become confusing. Overall, Network Solutions offers affordable and reliable managed WordPress hosting that’s on-par with other popular choices like BlueHost and iPage. It comes as no surprise that Network Solutions developed their own in-house control panel, given the fact that they’re such a large web hosting company. While many web hosts use the industry-standard and user-friendly cPanel control panel, Network Solutions chose to provide a useful alternative, particularly for their shared hosting plans. Their own proprietary control panel can be accessed via the “Account Manager” section. I know a lot of web hosts often receive negative feedbacks with their own proprietary control panel, but this one seems to be pretty good. It’s both intuitive and functional, and the interface is clear and simple. All of the core features and functionality you’d expect from a control panel are present. As for their VPS hosting plans, they use the Parallels Plesk Panels 10 (which isn’t the latest version, by the way) and Virtuozzo containers, which you can access through the Account Manager, as well. There’s a little bit of learning curve but thankfully, Network Solutions provide a handful of tutorials to show you everything you could possibly want to know when navigating their control panels. It’s not what I’m used to, but I don’t have real complaints with it. If you’re looking for a money-back guarantee, you’ll have to dig deeper into Network Solutions’ website to be able to find it. The good news is that they do offer a risk-free 30-day money-back guarantee in case you are not satisfied with their service. It’s pretty standard, but it’s better than not having a satisfaction guarantee at all. That said, there are other web hosting providers out there that offer a more impressive money-back guarantee. For example, DreamHost offers a record-breaking 97-day money-back guarantee which gives you plenty of time to test out their service. Network Solutions has a 99.9% uptime guarantee for both their Linux and Windows clients. This is to be expected from a reliable web host but if you deep into their Terms of Service, you’ll notice that they don’t provide any more details about the guarantee at all. There’s no information on the compensation provided if they fail to meet their promise. The truth of the matter is that Network Solutions have received plenty of complaints from their clients regarding uptime issues. The general feedback from clients seems to point to frequent and extended downtime or none at all. Obviously, it’s frustrating and downright annoying if you’re working on a site that’s always down and inaccessible. In terms of performance, you could also run into a number of issues that seem to happen on a regular basis. A lot of clients have reported unstable and buggy server. This means your website will run slowly, you’ll have a number of server errors, and you’ll have some issues with your email. I could easily deal with an email problem since I could get away with other email services like Gmail or Yahoo!, but that’s not the only problem with this web host. I went ahead and tested their performance with the help of IsItDownRightNow.com. I tested their servers’ response rate. Take note that anything under 20 ms is fast. A response rate between 21 and 50 ms is considered average, and anything beyond 50 ms is slow. I was dumb-founded with the results I found. At 512.75 ms, Network Solutions’ performance is super-slow! In fact, it’s the slowest I’ve seen! If Network Solutions continue to ignore user feedbacks and complaints, I couldn’t recommend them to my readers with confidence because this issue puts overshadows their otherwise impressive hosting packages. Do something about this issue, Network Solutions! If you need technical support from Network Solutions’ customer support staff, they’re just a phone call or email away. They also provide helpful online user guides and tutorials that will give you quick answers to common problems. If you need additional support, however, you can opt for MyTime Support for an additional cost. With it, you’ll get 1-on-1 appointment up to 1 hour with Network Solutions’ team of experts. They will help you with email setup, site transfers, and basic website tasks like adding links to their pages. The first month of service is FREE, but you have to pay a whopping $15.99/month if you wish to continue with the service. It’s good that they offer both telephone and email support but on the downside, there’s no option for live chat which would’ve come in handy for those who require immediate help from the customer support staff. They’re very active on both Facebook and Twitter, but they mainly use social media as a means to share industry news and updates with their services. There’s no evidence of client interaction at all. If anything, clients just keep posting complaints on their Facebook page, and Network Solutions just redirect them back to their ticketing system. Yes, they may offer priority support but you need to get a high-tier hosting plan for the purpose. Additionally, they’re also known for overselling the host, though I know they’re not the only ones doing this. Unfortunately, this puts them in a bad light in terms of customer support. If you search the Web, you’ll find a lot of clients consistently complaining about ineffective support staff. We all know how important it is to go for a web host that’s able to provide the same great customer service that clients expect of them, but in the case of Network Solutions, there’s still a LOT of room for improvement! In my personal opinion, Network Solutions seem to offer plenty of features that individuals and businesses need to build a solid website. However, reports about frequent downtime and issues with customer support put a dark veil on their reputation, which they need to address as soon as possible. Final Verdict – Fix the Downtime and Customer Support Issues! Network Solutions is a good choice for small business owners who are looking for a feature-rich web hostingplan that won’t break the bank. For the most part, their plans are flexible and budget-friendly, and there are plenty of options to consider for businesses that are expecting growth. 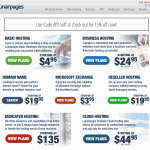 Yes, this web host may start out cheap, but all the add-ons and upsells add up fast. Their overall interface is confusing and makes everything more difficult than it needs to be. Seasoned web developers will appreciate the advanced features, but the less savvy ones might be overwhelmed, especially if all they want is a basic online presence. Some have also complained about their website builder, but even though it’s not the most modern and most intuitive out there, it’s still usable for creating great websites. There are plenty of things to like about this versatile platform, especially if you’re a casual user or blogger. But still, Network Solutions have a lot of issues to iron out. I hope they would address these issues soon before their otherwise “good” reputation plunges to the ground. There are many ills that keep it from contending with the likes of BlueHost, iPage and eHost, which are my personal bests. If they’re able to provide better performance and customer support, then, and only then, will I recommend them to expert web developers. Network Solutions offer wallet-friendly shared and VPS hosting plans, but needs to improve uptime record and technical support. They provide plenty of tools and advanced features to build a snazzy site, although the interface is a bit complicated.